The velvet love affair continues to live on, and not just ‘play it safe’ plain velvet. Boldly patterned and richly coloured velvets are everywhere, in our homes and, for the truly decadent, they are also in our wardrobes. When we first decided on the fabrics for our collection back in 2016, velvet was always going to play its part and we hunted high and low for a printer who could print on this challenging fabric to the standards we expected. All our designs are now available on our sumptuous British cotton velvet, produced in Lancashire by the last remaining velvet producer in the U.K. This fabric is multi-purpose and is loved by upholsterers, as well as curtain and blind makers. With the popularity of this luxurious textile not looking to fade anytime soon, we have added a new glamorous soft-sheen polyester velvet to our range (right). The advantages of this are the very high rub count, 60K, which makes it particularly suitable for use in very heavy traffic areas including commercial environments and it can also be used in clothing and handbags. As I am also a soft-furnishings maker, drape and handle are also massively important, and this new velvet ticks all those boxes. Due to the print processes, deeply coloured and patterned velvets are especially intense on velvet, therefore creating the ultimate dramatic design statement. In the New Year we will be launching our cushion range, which will include 6 designs on the polyester velvet and 6 on our silk cotton mix….We are also working on an incredibly exciting opportunity to make luxury, bespoke coats and handbags with this velvet. Watch this space!!! Velvet curtains and blinds are simply as luxurious as it gets, they are also very practical as they are one of the best ways of insulating against noise and drafts. If you fancy introducing velvet gradually, throws, stools, cushions and bed runners are a great place to start and mean you can quickly update your look. We recommend using a cotton velvet for anything that is actually going to cover you in bed, no one wants to sleep under a synthetic fabric, with the cotton and polyester velvet suitable anywhere else. If you have children and animals at home, we would recommend you using a polyester velvet in place of the cotton version for upholstered items. For a feature piece which only gets occasional use, both cotton or polyester versions are fine. Velvets are a tricky fabric to work with, and need to be made-up with the upmost care and attention, so always use a highly skilled soft-furnisher to make up your items. For upholstery, various fire resistance measures are required, a professional upholsterer can advise. All the pieces shown below were made to order using our cotton velvet. If you are interested in any of these pieces, please do contact us as we can make many items to order, or recommend trusted makers close to you. Curtain makers, upholsterers and furnitures restorers are in love with our velvets, not just in the UK, but also on the opposite side of the world in Australia! Custom ottoman in cotton velvet ‘Perfumes of the Night Abstract Edition’ in ‘Matisse Green’, by Alfie & Audrey, Australia, using fabric by Salon Libertine London. Ruth Basey of Alfie & Audrey in Australia was our first stockist. She contacted me after seeing our designs posted on our Instagram account. Ruth reinvents vintage furniture with a fabulous modern twist, or creates new bespoke pieces for particular clients, such as the ottoman shown here (left) which uses our ‘Perfumes of the Night Abstract Edition’ in our ‘Matisse Green’ colour way, on our British cotton velvet. All of her pieces are one-offs, and she describes these as ‘functional pieces of art’. The mid-century chair (below) has been restored and reinvented using our cotton velvet ‘Reflection’, and a delicious wool from James Dunlop Textiles. The colour of this evocatively named ‘Pink Lemonade’ wool, absolutely compliments the joyous explosion of uplifting pink in our design. As you can see, Ruth thoroughly shares our passion for colour and bold design To see more about her wonderful work, click here. 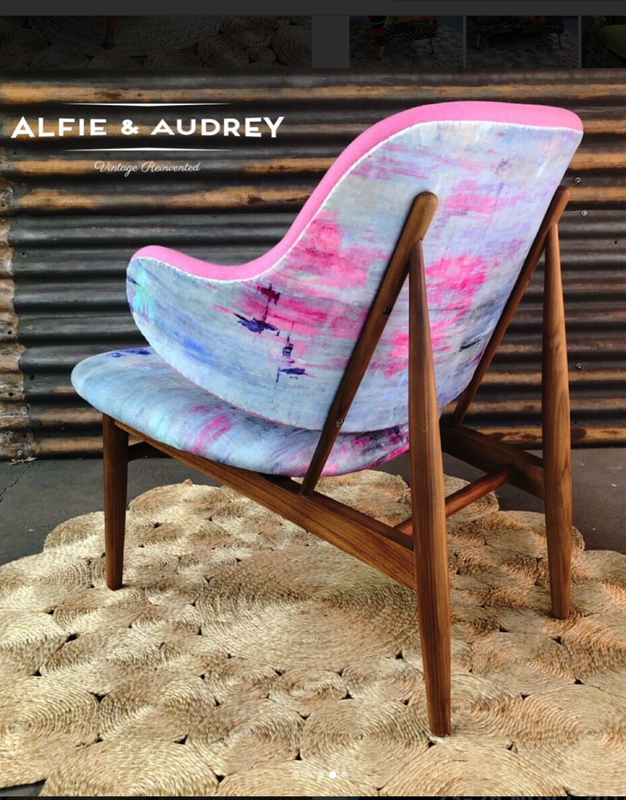 Mid-century chair restoration by Alfie & Audrey, Australia using cotton velvet in ‘Reflection’ from Salon Libertine London. 1970s sofa restored by Leigh-Anne Treadwell from The Bristol Upholstery Collective, using cotton velvet from Salon Libertine London in ‘Perfumes of the Night Floral Edition’, in ‘Matisse Green’. 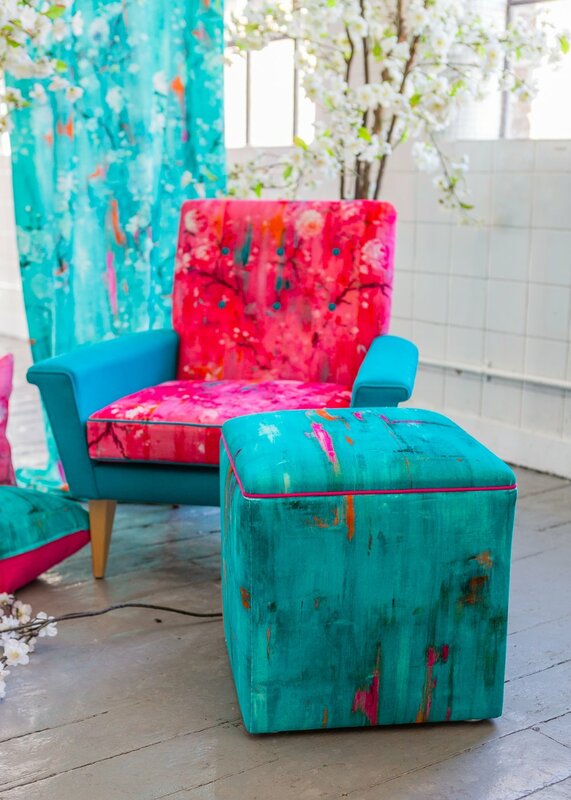 When our stockist Leigh-Anne Treadwell, founder of The Bristol Upholstery Collective contacted me about using our fabrics for an up-cycle project for the BBC’s ‘Money for Nothing’ TV programme, of course I was massively excited! Leigh-Anne loves to work with British artist designers to create unique highly decorative pieces of furniture art. Leigh-Anne chose the ‘Matisse Green’ version of our ‘Perfumes of the Night Floral Edition’, on our cotton velvet, with burnt orange piping and co-ordinating industrial style metal legs. We love how this 1970s sofa turned out! The programme will be aired in the Summer of 2019. Our velvets are available to order by the metre, priced between £115 and £145 RRP. Copyright Salon Libertine™ London 2018.